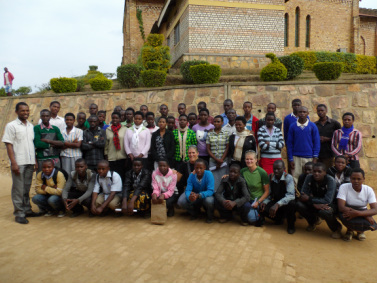 A group of students seeking sponsorship for the 2014 school year. Secondary Education in Rwanda is not free. 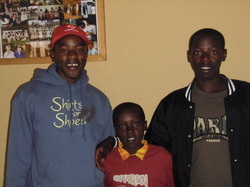 We offer the opportunity for individual sponsorships for students going to Secondary School in Rwanda. At that point in their education students attend school on a room and board basis. Many families cannot afford the $250/year that it costs to go to school. Our program allows them to attend and have the chance to achieve that higher level of education that may help to break their cycle of poverty. To become involved by sponsoring a Secondary student or getting your school involved in a school sponsorship, please contact us. How does Kids for Kids find the students to sponsor? Carolyn Spence, Chair of Kids for Kids, travels to Africa every summer and identifies schools we can partner with. She has built significant relationships with school leaders that allow us to seek sponsors with confidence. A process for students applying for sponsorship with Kids for Kids has been established. How does Kids for Kids support itself? Operating costs have been covered by donations specifically earmarked for that purpose. We also plan to fundraise and apply for grants as we have charitable status. No sponsorship money is used to cover operating costs. How does the money get to the students? Money is transferred to the bank account of the Diocese, who oversees the schools in Rwanda. We send the fees over three times a year via wire transfer. How will I know how my student is doing in school? We are working towards school reports being sent to Kids for Kids couple of times a year. We will then forward them to the sponsors at the address you have provided for us. How can I communicate with my student? Forward correspondence to Kids for Kids and we will forward them to the students. A number of the students do have the ability to communicate by email and/or Facebook - if you are interested.